> Do you have an interest in the paranormal? 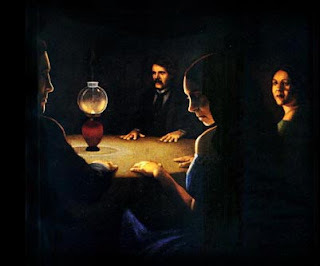 Have you ever had an experience with ghosts, reincarnation, strange creatures or UFO sightings? Are you just curious about the things that go unseen in the tangible world? I have decided to hold chats on Thursdays where like-minded people can get together, get to know each other and feel safe in discussing their experiences and beliefs. For now, we are going to try out two chat times at 2 p.m. EST and 8 p.m. EST on each Thursday of the month. Our chat room can be found at http://tinychat.com/jj9828 and anybody can use that room whether they have Twitter or not. The only rule is that you will be respectful to each chatter. Any flaming, trolling, spamming, etc., will result in being banned from the chat. If these chats go well, then I will start holding History Tuesday chats as well. That sound like a cool idea. Kind of like instant messaging or something. It doesn’t sound like a forum.